Just one side left to go, and I can get busy putting part 6 together. Part 6 includes a pieced star border, and then a final border print. If you haven't seen it, you can check it out on the Quilt Mania website. But before I get busy on part 6, I'm going to spend some time sorting out the sewing room, it's getting kind of messy and I find it hard to sew when I'm edgy in my environment. I may also have to send some of my fabric out into the world. I have Way. Too. Much. Fabric. Not sure I ever thought I'd say that!! Alrighty, I have some chores to take care of, then it's back to the appliqué, chatter soon! Ugh, just noticed that my fern needs a little 'greenhouse' time. It's amazing what you pick up in a photo but can ignore in real life! But back to the quilty component of this post: This past week I have been producing spider-web place-mats at a rate of knots! Here we have a gratuitous 'while quilting' photo. I have to say that even though I'll never have mad photography skillz, I'm enjoying my new iPhone and the pictures it takes a good deal better than my old one. Though this 6+ is huge in my small hands! I made three different colourways - these ones are largely reproduction fabrics. The eagle eyed among you will recognise one of the red fabrics from my Farmers Wife quilt. These ones using some of the Jinny Beyer fat quarters that I won (I think last year) at our guild show. Here are the mats ready to head off to their new homes. I'll be passing them along today, and only just finished them yesterday - I always manage to cut things close to my self imposed deadlines! I've been busy during the week working on a bunch of spider-web place-mats, and I'll share a picture with you in my next post. I probably could have done so today, but this girl of little brains just forgot to take a snap or two. I'll have to take another pic so you can see how they all look together. Now that I've had a grizzle to some of my friends about Nutcrackers being harder to find this year, I'm seeing them in a few more places, but I'll have to restrain myself ... I really need to save some money for my vacation next year. I skyped with Linda during the week, and I'll be booking my airfares shortly - DH will be booking some annual leave so he can holiday with the little guy while I'm away, it's all looking good! I was trying to work out if I wanted to do any more Christmas decorating in the front rooms, and I've decided I'm going to leave them be for now. I need to tidy away those messy cords, and neaten up the quilt rack. It's amazing how you don't notice those things in real life, but in a picture they stand out like crazy. Well, that's it from me for today, I'm going to get back on to the spider-web place-mat production line, so I'll check in really soon! A big thank you to my sweet friend Bridget - on two counts! And a gratuitous close up so you can see more of Lizzy's fantastic quilting. A ribbon for her, and one for me too :-) Sue Garman's pattern is just wonderful - and it was a delight for me to put the quilt top together - albeit a good deal faster than I anticipated I would. 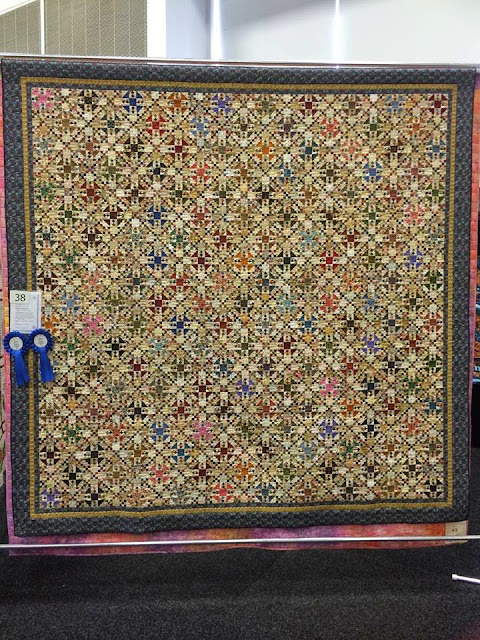 I'm just so thrilled that my quilt did so well, I really hope I get an opportunity to visit with it before the show ends on Sunday. He's front and centre there with the gold crown and green glittery legs - isn't he so very cute? I only have seven large Nutrackers (and about eleventy small ones on the tree) so it's not much of a collection really, but I really like them and see more in my future. There's one in Myer that's about a metre tall ... and at $100 is a little rich for me ... but trust me, I'll be there with bells on if he's still around in the post-Xmas sales! Just a quick note for my Thimbleberries loving friends out there - I've just created an Ebay listing for my set of Thimbleberries Porcelain Stocking Ornaments. They just don't suit my decor any longer, and I know someone out there has probably been hunting for these for ages, you just don't see them around any more! And because we're starting to get into the Christmas spirit, I've pulled out a few FQ's to make some spiderweb placemats to give away - I have a number of them to make this year, I hope I can manage them all. A while back I won a whole pile of Jinny Beyer FQ's in our guild show, and I will use these for some of the spiderwebs. They're not Christmas fabrics, but the colours work don't they? Hopefully I'll get all the strips cut and sewed tonight, and then I'll cut the wedges tomorrow. Better run, chatter soon! Okay - someone needs to tell me where the past week or so has gone - because I have no clue! I know I've worked - done chores - we're at tennis 6 times in a week - and I guess taking care of the house and fam ... but other than that, I just can't account for what I've been up to. I'm looking forward to the next instalment of the magazine coming out. Quilt Mania is a bi-monthly magazine and I've lost track of which month it's issued, but I feel sure it must be soon. You can see a little of the quilting on the bit that's overhanging the table ... but only if you look really carefully. This is one busy quilt! And here you can just see the fabric I chose for the binding - it's a cute dark blue repro with a small beige pattern with red berries. I don't think it really would have mattered what fabric I used in the border and the binding - the piecing seems to really divert the eye. Now that I'm done, I've been able to get busy with some more of the appliqué on the Di Ford Montmellick mystery. I'm getting really close to being done with the broderie perse now, and I'm thrilled! Just a few little doodads to add in the top left hand corner, and a few motifs on the right that you can see there. And though you can't see, I need to add a few leaves to the bottom right corner piece. If I'm a good girl, I may be able to finish it tomorrow. And the next step will be to add the background for the next round. A whole bunch of appliqué melons. I'm looking forward to them. But first I have to fix an oops in the pieced triangle border at the top ... I'm glad I noticed it before I got too much further ... can you see it?? The two hourglass units in the centre need to be taken out and rotated one quarter turn each. I have two lights next to each other, and two darks next to each other - oops! I would have kicked myself if I didn't find that until I was working on the quilting! Labels: Di Ford Mystery Quilt, Omigosh! Hi all! School holidays mean I've had little time to myself, Camo and I have had a mini-break with my Mum, Nanna and Amy - we went down to Goolwa for a few days. Such a nice time, and I managed to find a sweet little quilt store too! Don't forget that if you love it, the pattern is a quick and very inexpensive download at my Etsy store. And yesterday I visited with my sweet friend Lizzy to see how Omigosh! is coming along. I'm thrilled with how Lizzy's quilting it, and I hung around a little while to help bury threads. Because the quilt is so busy, it's hard to see the quilting very well, but I bet it'll look fabulous from the back. See that mid blue fabric above - that's the fabric from my first ever quilt I told you about a little while back. The top narrow borders have been quilted too, but once again - busy fabrics make the quilting hard to see. So, they're all the photos I have to share in my phone - I can't believe I didn't even manage to take any while we were on our little break. Over the next few days I'm going to be up to my eyeballs in binding, a label and a hanging sleeve for this quilt, so things could get a little quiet again. I promise I'll check in really soon! Isn't it amazing how fast a weekend can fly by? Saturday was a lovely day, spent with the 'Not the Farmers Wife' stitching group. This time we were hosted by the lovely Loz, and a great time was had by all. I'm always so sketchy with a camera, but I'm sure you'll see pictures around blogland/Facebook from those who were clever enough to take pictures. 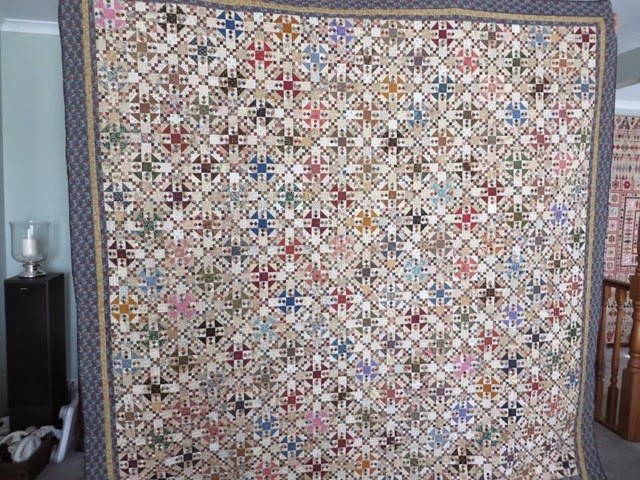 I did manage to get a fuzzy picture of Loz's delightful vintage quilts, aren't they stunning? For the Pinterest aficionados among you, you may recognise the pink one there - it is famous on Pinterest, pinned from our dear friend Shay's blog. Some day there will be a pickle dish quilt in my future, I'm sure of it! And then on Sunday, it was lunch and lounging at my parent's house. It was my Mum's birthday during the week, and though we visited on the actual day, it makes great sense to extend birthday celebrations as long as possible. Kath's tree skirt is now quilted, so I just have to cut the opening, and bind it. Her hubby is visiting in the last weekend of the school holidays, so if I'm a really good girl, I will have it ready for him to take home. Fingers crossed! Part five has come out in Quilt Mania, so once I've finished with the applique component from part three, I will put the next lot of background fabric in place and get busy with the applique melon shapes. 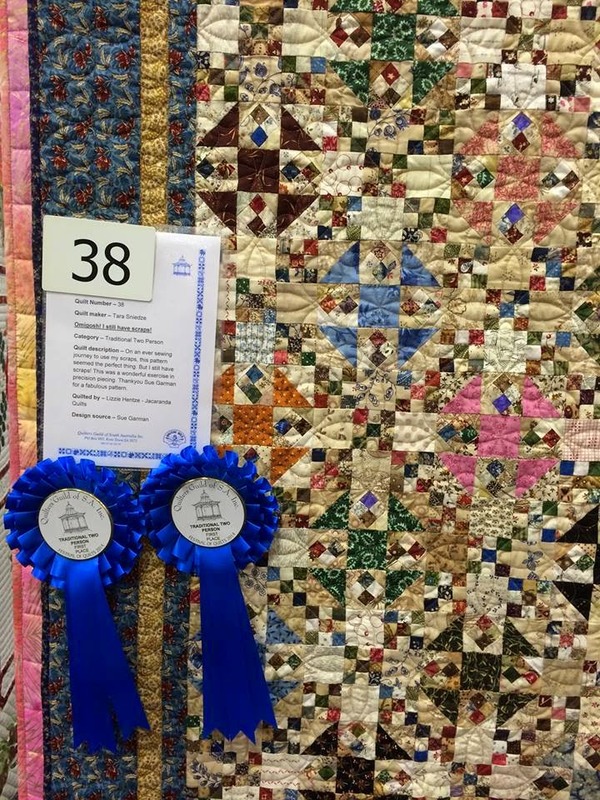 If you're interested in seeing what the next round looks like, you can check out the Quilt Mania magazine website, or check out the Quilts - Di Ford on my Pinterest site. I just love pinning things on Pinterest - such great eye candy and inspiration. Alrighty - I'm going to get busy working on some more applique while Camo is occupied, and later I'll find something we can do together. I do love school holidays! After I finished the Omigosh! quilt top, I immediately got busy working on the next project on my list. I had promised my Paris loving friend Kath that I'd make her a tree skirt, and that I'd have it to her in time for this Christmas. I just love the Eiffel Tower fabric - it's super cute. I think it's a Lakehouse print, and sadly I really only just got enough for the project - I only have a small strip left. Just needs quilting, trimming and binding. This is a pattern I designed a while back, and is one of the most downloaded patterns on my Etsy store. 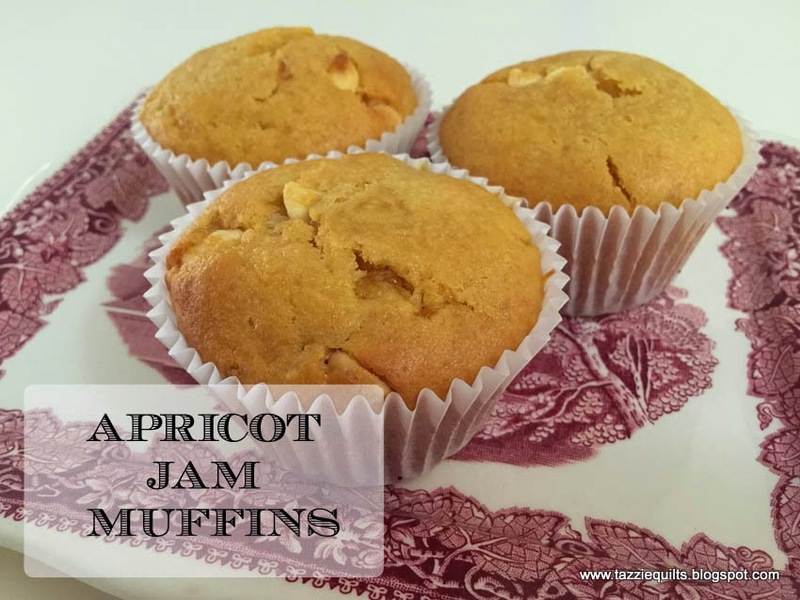 If you feel like you'd like to make one, just click here. Something else I've almost finished this week is a pair of socks I've been knitting for quite a while. On the grey and white pair there, they'd been sitting at a point that always has me stymied. Each time I need to graft the toe, I have to check YouTube to remind myself how to do it. For some reason it just doesn't stick. I made myself get busy and finish that step and now I just have to weave in the ends. They're a gift for my sweet friend Vivienne. And because it's nice to have something on the needles at all times, I started a new pair immediately - I'm using some new-to-me sock yarn from the Bendigo Woollen Mills, and it's really lovely. Teeny tiny 3" LeMoyne star blocks. I'm just in love with them - the fabric choices are just delightful. Today we basted the quilt sandwich and Victoria is going to get busy hand quilting this gorgeous quilt.